What do whales and dolphins eat? Home > About whales & dolphins > What do whales and dolphins eat? Toothed whales (including all dolphins) are carnivores; they eat other animals. Dolphins eat a variety of fish, squid, shrimps, jellyfish and octopuses. The types of fish and other creatures dolphins eat depend on the species of dolphin, where the dolphins live and the wildlife that shares their habitats. There are more than forty species of dolphin and they live in environments ranging from freshwater rivers, estuaries, and coastal waters to deep sea open oceans. Most dolphins are opportunistic feeders, which means they eat the fish and other animals sharing their homes. All dolphins eat fish and those living in deep oceans also eat squid and jellyfish. Bottlenose dolphins are found worldwide in temperate and tropical seas and the types of fish they eat, is dependent on where they live and what time of year it is. Bottlenose dolphins living in the Moray Firth, Scotland, favour salmon when it is available in the spring and summer months. 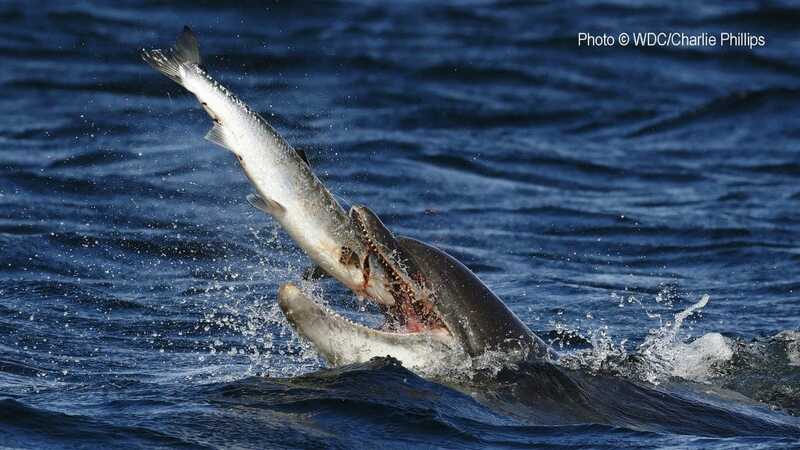 In the winter, salmon is scarce, and so they eat herring and mackerel. Bottlenose dolphins living elsewhere eat their favoured local fish which can be mullet, mackerel, catfish and more tropical species of fish. All dolphins have teeth but they don't chew their food, they just, grab, bite and swallow! Amazon river dolphins are known to eat more than 40 different species of freshwater fish and they also eat freshwater crustaceans. Spinner dolphins eat fish, jellyfish and krill. Dusky dolphins eat shrimp, squid and various fish, including tiny anchovies. Rough-toothed dolphins live in deep water oceans and eat mostly squid. Commerson’s dolphins feed on small fish, crabs, octopus, and small crustaceans in kelp beds close to shore and near the seabed. New Zealand dolphins feed on species of small fish and squid in shallow coastal waters. Orcas are the biggest members of the dolphin family; resident orcas in Northern British Columbia, Canada eat only fish – their favourite is salmon. Other orcas specialise in eating much bigger prey including seabirds and mammals such as sea lions, dolphins and whales. Orca diet depends on what food is available to them where they live and what techniques they have learnt from their elders to hunt their food. Baleen whales extract their prey from seawater as it flows through or is forced through their baleen plates using their tongues and sometimes their throat muscles. They eat small shrimp-like krill, copepods and fish. While whales and dolphins are thought to have a keen sense of taste, they lack an olfactory nerve and associated lobes and therefore it is believed that they are not able to smell their food. How do whales and dolphin drink? They get all the water they need directly from the food they eat. Their main prey (fish and squid) contains large amounts of water. Dolphins don’t lose water by sweating, like we do, and so they need less water than us in their diets.